Oh, the Weather Outside is … Rightful! 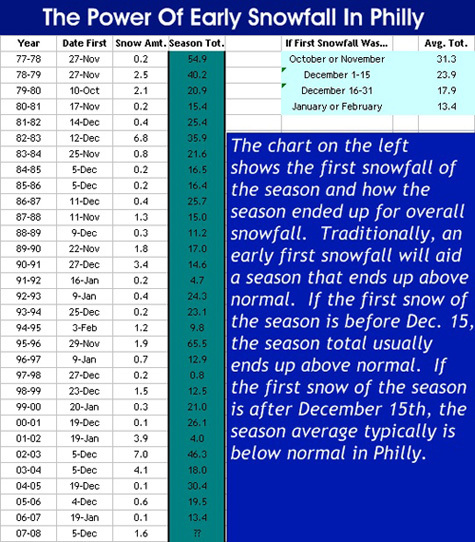 I found this interesting chart about snowfall totals in the Philadelphia area. It seems the earlier we have our first snowfall, the higher the season snowfall total. Unfortunately it doesn’t seem to be working out this year. Our first snowfall was in early December but we’ve barely seen an inch of snow since then. Today will help – we’re expecting five inches of snow in Upper Bucks County. Schools are closed, roads are a mess – but it’s a sight for the sore eyes of this photographer!